The full verdict: Portmanteau films risk outstaying their welcome long before the end credits roll. 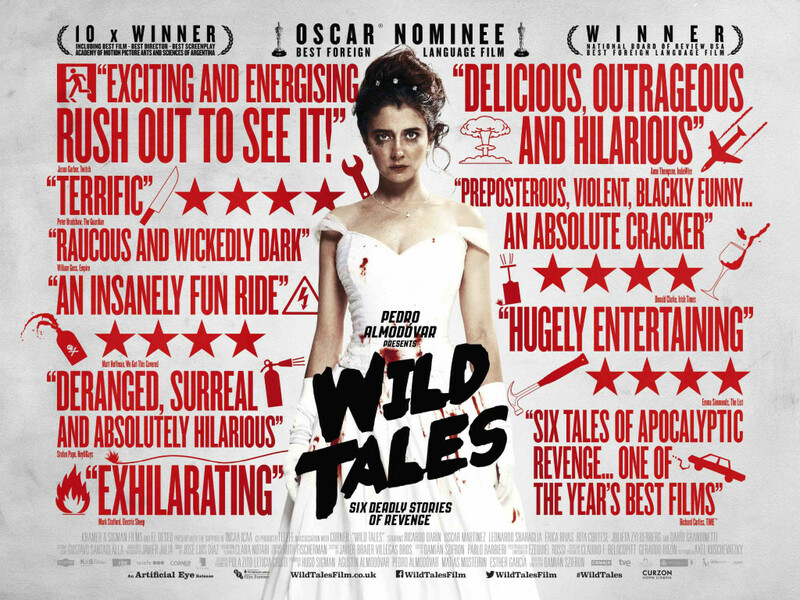 And with a solid two hour run time and 6 stories to get through (including a pre-credit prologue), Wild Tales could have easily wound up in Four Rooms territory. Luckily, it joins the ranks of Creepshow, Cat’s Eye and 1972’s Tales from the Crypt as an anthology movie to die for. Not as obviously a horror movie as those films, these are still tales that witness madness, tapping into social anxieties and spiralling them dizzyingly out of control. Passengers aboard a plane discover they all share past wrongdoings (in a story eerily echoing the 2015 Germanwings tragedy). A waitress in a remote diner finds herself holding life and death in her hands when she serves a man who ruined her life. An affluent egotist inadvertently unleashes road rage Hell when out for a drive. A demolition expert declares war on those imposing unjust parking fines. A rich industrialist bribes his gardener to take the fall for a crime he didn’t commit. And a wedding day isn’t quite the happiest day of one couple’s lives. Unusually for a portmanteau, there is no runt of the litter that brings the film down. Road rage episode “The Strongest” is likely to emerge the audience favourite due to its sheer bravado in sustaining a fight in the middle of nowhere, but all the stories delight in their own way. And all have a social outrage that propels their characters headlong to either destruction or some kind of deranged enlightenment. Or one following the other. Opting against criss-crossing between stories, Szifrón subtly links his tales. Excluding the prologue, the first film opens in the middle of nowhere, the second film’s protagonist drives towards a city, and once in the city films three, four and five move up the social ladder, with life getting no easier. While characters have revenge in mind, the director shoots everything through a black streak of absurdist humour. Save perhaps for the industrialist’s tale, a perfectly played pressure cooker story of class opportunism, boasting a climax that resonates long after its abrupt shock. Of the cast, audiences are likely to recognise The Secret In Their Eyes’ Ricardo Darin, here playing the demolition expert fulfilling most people’s fantasies of taking on faceless bureaucracy. Every actor brings their A-game, the film unleashing Erica Rivas in the final story. Her portrayal of a callow bride faced with humiliation runs a glorious gamut of emotion, from grief to anger to gleeful madness and beyond, bringing the film to a magnificent crescendo. A reminder of how smart, clever, funny and exciting popular cinema can be. Blu-Ray review: A clean, crisp transfer that does justice to Javier Julia’s rich cinematography and Maria Clara Notari’s imaginative set design (note how claustrophobic the industrialist’s seemingly massive house is). Extras extend to an informative 24 minute making-of. Boasting interviews with all key players, including co-producer Pedro Almodóvar, it shines with the enthusiasm all involved had for the film. Director Szifrón provides interesting facts such as there was discussion of making the films wildly different, including black and white and changing screen ratios. Glimpses of behind-the-scenes footage and enticing storyboards and concept art leave you wanting a little more background on this great movie. A six minute interview Szifrón again reveals him to be a personable speaker, while the trailer is a perfect example of how to sell the appeal of a movie while avoiding massive spoilers.